← When Life Gives You Lemons… Get Stinking Rich! My favourite subscription box thus far has to be Loot Crate. Again, it’s another box full of nerdy paraphernalia all based around a common theme… but Loot Crate really do seem to put a lot of effort into the box designs, making video content and finding items that fit together one way or another. Okay, so it’s just a standard 4Gb USB2.0 memory stick in the shape of a wolf; it’s impractical, spiky and won’t go on my keys… but I love it. It’s a useful little gimic that no one else will have. I’ll be able to stroll into my CompSci class and get it out to both show my love of the show and explain that it’s an exclusive item from a little something called Loot Crate. It’s a talking point and, let’s face it, someone needs to show a little love to the Starks, right? 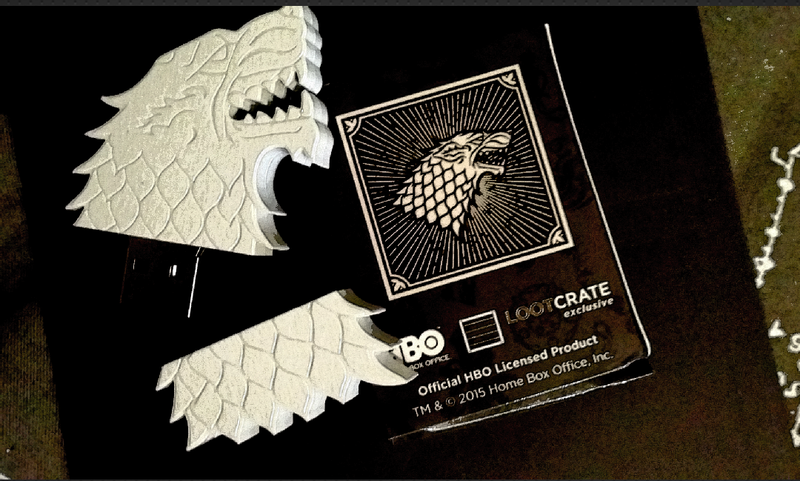 This entry was posted in Subscription Boxes and tagged April 2015, Fantasy, Game of Thrones, Games, Geek, Loot Crate, Subscription Box. Bookmark the permalink.